About a decade ago, when I was writing Sayonara Amerika, Sayonara Nippon: A Prehistory of J-Pop, I had the idea of trying to organize the release in the U.S. of a series of compilation CDs of a variety of Japanese popular music genres: city pop, folk-rock, etc. I even pursued informal conversations with a record label about doing this, and they showed a fair amount of interest. But then I thought about it seriously and realized that once I got to work on a project like that, it would take over my life for the next several years. As much as I liked the idea of having the CDs out there, I wasn’t all that eager to surrender control over my life. So it never happened. 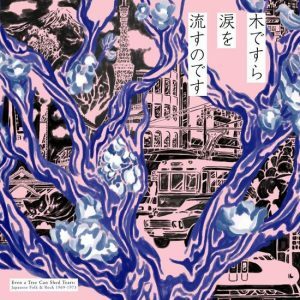 But now the good people at Light in the Attic Records have stepped up with a fine compilation CD, Even a Tree Can Shed Tears: Japanese Folk & Rock 1969-1973, which collects a nice cross section of the genre. They’ve done an excellent job of curating, combining well-known tracks (Happy End’s “Natsu nandesu,” Hachimitsu Pie’s “Hei no Ue de,” or Yoshida Takuro’s “Aoi Natsu”) with some quite obscure treasures (Yamahira Kazuhiko & The Sherman’s “Sotto Futari de,” for example). Kagawa Ryo passed away earlier this year; I wish he’d lived long enough to see his first official U.S. release: the brilliant 1971 song “Zeni no Koyoryoku ni tsuite,” with fierce backing from Happy End, is included. The compilation also introduces terrific recordings by Asakawa Maki, Kato Kazuhiko (as a solo artist), Kanenobu Sachiko, Hosono Haruomi, and The Dylan II, among others. The CD comes with excellent liner notes on each of the artists, plus English translations for the lyrics. If I have any complaint with this set, it’s that I wished they also included the original Japanese lyrics in the booklet, but that’s a minor detail. Even better: the label plans to bring out more reissues of Japanese popular music in the coming years. I’m so glad that somebody finally got around to doing this, that they did it so well–and that it didn’t have to be me.